Oh la ladder has claimed a victim! Oh la la! Mess mess and more mess! Over lit and then over exposed by flash, so all you can see really is that I am actually working. And achieving too; if you're going to Japonica's Craft day Extravaganza in Exmouth next month, you will find yourself getting quite familiar with one or another of these cards. I've enjoyed them too, just a few notes to type up and it's a ready workshop. Then I need to tidy up and quickly. A workshop on Thursday morning needs preparation (like unpacking from the last one - it will help), and there's the crop on saturday. And you know what sort of prep that takes. I don't know whether to shout 'clear the decks' or just move to the floor...ask me again on Friday! Oh and to get a WOYWW badge - all you have to do is be a regular WOYWWer and ask me for one - as in, email me your address. And then be a bit patient please! See, here there's no shame, share your desk..no doubt the fascination for me is seeing what everyone's making, and where you do the making. Join us do - photo your desk, upload to your blog and link here. We'll visit. Slowly probably, but hey, it's what the days between Wednesdays are for! I'm definitely up for a badge...might dig out my school blazer and put it next to my Duran Duran one... what apic... did you throw it! Good aim... wishing you oomph with the prepping and clear up...make that Ultra-oomph! Yikes, I just about got trampled in the stampede! glad to see the ladder has a new home, as for the desk, I like your idea of moving it all to the floor. Or you could just come over here and use mine, I've got no use for it at the moment! PS. Like the WOYWW badges very much, will email for one! Oh and poor Mr Dunnit - well, actually had he DUNNIT and moved the flipping thing he might have survived. But you had a giggle staging that one LOL! Poo about the ladder - will miss it!! but glad about the badge... they are scrummy yummy so I hope I qualify... I love looking here and seeing your stuff!! Well, if nothing else I'll miss that ladder. Must tell my friend about the Exmouth do. I had a good laugh about the ladder. It was a great shot, too! As for your desk, I'm so, so impressed with everything you are working on. Talk about one busy gal! I know the crop will be fun and the workshop will be well worth the time. BTW, I will wear my badge with pride and WOYWWendy will be SOOOOO jealous! I hope that Mr D survived his trip under that ladder. He's hanging on to that fork for dear life! Great mess you are making there and it sounds like it going to get worse before it gets better too! Will email for me badge... I love badges too so thanks ever so for that in advance. It will be great to wear when I'm demming or go to the shows. LOL! that's quite view of the ladder this week. my, you're a busy gal, Julia. i have no idea how you can get any housework done with all the crafting activities in your sked! so of course i think your desk is quite neat (only one layer high) considering. happy WOYWW! and of course i want one of those badges! There's a lot happening on your desk this week. Those cards look interesting. Wouldn't mind a close-up of them. I love your pink baskety things for pens etc! I presume no animals (or persons) were harmed in the making of that other pic? Good one! So no more interesting pics with the ladder as a prop in the background? I am sure something else will take its place in due course!! Your desk looks interesting, the cards look very involved... but you know me, cards scare me to death! Oh dammit dunnit! I knew those ladders would claim a victim eventually...your new van like our new van can fit an amazing array of massive things in it. Our ladders are in it and they are big un's too! Your desk looks really colourful with the over exposure & to be honest with you that look really takes your eye off the fact you need a good tidy too, thumbs up eh! :)...have a good week! Oooo can I have a badge too...I will wear it with the pride it so rightly deserves..! will e-mail the details. Aw, I'm going to miss the ladder! I was in a clean the desk or move to the floor...and I took over, well, everything! I'll need to clean Thursday though, or AJ will have no where to sit when we get back from New York! The cards look great! And it sounds like you have a lovely weekend coming up with the workshop and the crop! At least it wasn't the pitchfork that claimed a victim, lol. Niiiiice pitchfork. I'd love a badge! Sadly, I prolly won't be coming to any shows in the UK; but I'll still wear it proudly! Lovely messy desk, Julia. I'm sure whatever you are making will turn out lovely! Have a great day in Exmouth next month. Happy WOYWW and thanks for all you do! Wow! Sounds like you're a busy girl this week!! Glad to see your ladder's been moved...you know they take on a life of their own after a while...and they start attacking! Haha!! Thanks for the peek at your desk. The cards look lovely...wish I lived close enough to come see them in person at the Extravaganza next month, but I live WAY too many time zones away! bubbesbiz7@gmail.com Thanks for doing this for us! Well, I sure wish I lived in England to try out some of these shows I read about! Would love if you would post a close up of the cards after your show and class...they look interesting and lovely. I'll bid adieu to the ladder...it always scared me...my DH fell off the ladder at our house, landing shoulder and head first on the cobblestone path to our side basement door. It was months before it felt right...and plenty of $$ at physiotherapy. At $83.00 per hour for the physio every week, he no longer climbs a ladder!!! Thanks for another great week! I will email you for a badge. Busy, busy, busy! I wish I was near to take a workshop from you. The cards look awesome! Love the creations on your desk and will have to zoom in to look at all the detail. I do hope the pitchfork is still there next week. Makes me feel normal seeing other people leaving stuff all over the place. I sent you an email with my mailing address. Would love a WOYWW button!! Will miss that ladder, is the fork still there?? Your desk is wonderful, would like to see a close up of the card, the colours are beautiful. I would love a badge, can't wear it over in England, but I can proudly display it here in my office in Aus. Couldn't get the email bit to work so my email is vonnykaus@yahoo.com.au. Lol. I don't read fine print so something else caught my eye in that ladder picture so I focused and couldn't believe I saw a body below that ladder. Hee hee. I wonder how many people will miss that? Anyway, wish I was going to all those fun events you're prepping for. They sound like lovely crafting times. Enjoy! What...were did my ladder go??? LOL. You desk actually looks like you have a method to your madness. Not messy at all...organized chaos! I get it big time! Hope you make it through all the fun days ahead! You're looking very productive this week! Someone had to prop all those things on top of that man, or you wouldn't be posting this today. Amongest all the fun you create, you do keep a tight schedule. But when fun is involved it keeps us young. Enjoy your events and WOYWW. Love the comedy ladder picture Mrs! You need to scrap that, in the best sense of the word! Hehehehehe. All sorts of loveliness on your desk today and yes please I would lurve a badge - might give me an excuse to pop over to the crop on Saturday! Ah! 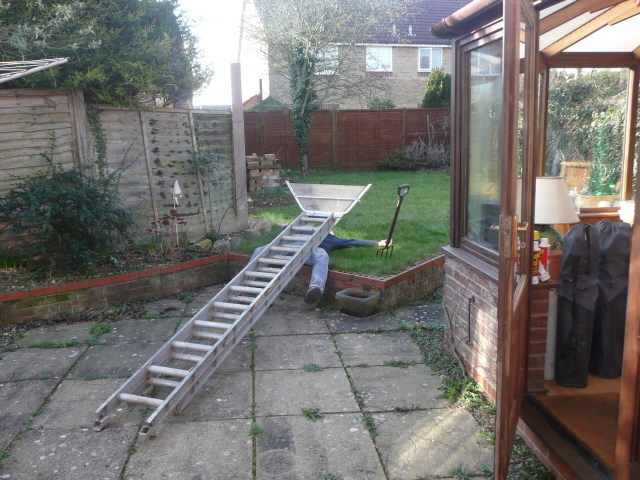 Farewell Monsieur Ladder - I will miss you. Nice to see such activity on your desk - I sadly won't be at Exeter so it's nice to see what I'm missing! Happy Wednesday! hhahaha LOVE mess Julia, uchhh watch mine 8| Have a great day!! Love the photo of the ladder!!!! Japonica Exmouth eh? May have to check out their website....sounds like you are way to busy planning for classes and crops to craft for yourself hun! I'll email you for a badge please....if those of us in the UK wear them to craft shows, who knows who we may meet! That ladder pic is a classic lol Have linkied up my blog adn will do the rounds of everyone else's as soon as I get these kids fed, bathed and off to bed! HAPPY LEAP DAY MY LOVELY!! I hope the "victim" - poor Mr D I assume - under the ladder is ok!! I am emailing you for a badge - how kind!! Can you believe I woke at 1.45 am and came to link up... sad, very sad this addictive Wednesday obsession of ours. Oh, your desk - have to go back for a closer look now. Lovely to see you desk in full creative flow Julia. I think we should all have one of those badges. I'm proud to be a WOYWWer and I will wear mine with pride. I will email you my address asap. The water coloury cards look very interesting, just push back or move onto the next available clear surface, but you know that's my theory! Did you clear away the body as well as the ladder or is it still splatted on your lawn? you do know there is ample room to craft in the back of a van? passion wagon = crafting passion after a certain age. I do like you overexposed messiness, and the japonica certainly looks enjoyable, off now to email you my addie so I can get my woyww ID. Love looking at your desk, there are always so many yummy things on it. Inspires me to go shopping - oops! What do you mean "no more ladder" - shall miss it! LoVe your desk ... mainly because it makes my chaos look almost, kinda, sorta tidy and it is just so productive ... busy, busy, busy! Love the victim under the ladder. I had to look twice to see him without my glasses! As for your desk, just stack it in the floor or just keep using the push back method! Your much too busy to actually clean! Its always so refreshing to see everybody elses work desks in the same fashion as mine.... a mess! Is there someone laying under the ladder? *LOL* Did they get packed up with it too? I love your chaotic desk. At least you have a view! I'm in the basement and thankfully we have glass block windows to let light in. I do miss being able to stare outside though. How can I be certain I'm looking at the right desk if the ladder has gone. I NEED a WOYWW badge as I have a meeting with WOYWWers arranged! will e-mail shortly. I so love looking at messy desks. It makes me feel right at home. Busy, busy, busy desk Julia, a busy desk is a productive one! LOL. Enjoy your crop I find I take everything but the kitchen sink to ours and then just sit nattering and eating cake! This is the first time I have joined this event. There was me thinking I was making a reasonably earlystart & I am number 96. Have fun at the crop - wish I was going but right now I am surrounded by my craft room in piles. I ought to take a pic of that too! It will all be worth it. I've just spotted how many baskets you have, I do like your basket of baskets. I love baskets too but then I am a self confessed basket case! Great desk, Julia you are such an enabler! And you may want to remove the guy under the ladder.... poor soul. best wishes for a great and busy week and weekend! What will we do on a Wednesday without the ladder? You look so busy, do you ever actually stop? And yes, please, I'd love a badge, will email you. Thanks. I can tell a lot of creativity happens there! Enjoy your classes, it's always fun to share your love of crafts with others. I would love a badge. Thanks as always for your thoughtful comments!! What a lovely yard! Do you get to craft in the room to the R with all that lovely light? sigh! Lots of busy crafting on your workdesk as usual. Makes me feel like a slackard. Your desk and my desk seem to be in competion to win the title of messiest desk. You're allowed though cos you are a tad busy at the mo. Japonica......I haven't seen Janet for years......say hello to her for me please.Good luck with all the prep. Your workdesk looks so exciting - so many wonderful things to look at and great projects begun! Wishing you a happy day today! Looks like your working on some great projects on your work desk!!! That ladder picture is too funny! Your cards look beautiful! I forgot to take my desk shot, so I can't play this week! So sad! Good day! I love the creative energy of your work space and your view is so lovely! Alas my little space isn't chock full of anything exciting today! I did see a sign that said my desk was clean yesterday sorry you missed it, well apply that to me just the other way around! I had no idea the ladder was vicious!!! Thanks for another great look at your desk. I do know all about class prep and gearing up to stamp elsewhere. There is a lot of work involved. I am very impressed how many folks do manage to stop by. I visited about 80 myself. I think I can get more this week though since I'll be slogging at the switchboard. Oh! Off to change my comment box to the pop up kind now. I did get my desk nicely cleaned and organized last week but... oh well! One cannot be creative or get stuff done if their desks are always clean. LOL! Been spending too much time commenting today I've left my e-mail address instead of just my name. Those birds on your desk look great, so soft and pastel. Thanks for the full monty on the ladder. I do so love a good done with the ladder tale. Keep smiling and hosting, here's to always having a view from your window that makes you smile. Very busy desk Julia...all looks very interesting. Thanks for linking me to everyone's work space! I love seeing it. The story of the ladder is funny! Messy is good, messier is better. It really does look like work is being done and that's what are desks are all about right? Happy Wednesday! I used to live in Exmouth and know Japonica's. Although I remember it more as a gift type shop with a little bit of craft stuff. It was where we bought our joss sticks when I was a student! Busy desk! Mine's always messy if I'm working on stuff. :) Looks like some very lovely cards in the making! Im enjoying your show and tell day and am linking up with friends from other blogs. I think I might miss the ladder now! :) Love the mess - definitely a sign of a busybusybusy woman! Can you at least leave the pitch fork? Or perhaps you could put something new in place of the ladder ... see how long it takes us to notice! Thanks, as always, for hosting this delightful romp around the world!! Julia! I'll miss the ladder. But yes, it was an accident waiting to happen. I'm thinking the banging of a shin. I just noticed that nice wicker (I think it is meant to hold water glasses???) pencil holder, desktop rear left. It's like a wicker tray holding wicker pencil cups. Wow, this seemed to be easier last time I did it. Getting used to a newish computer. Thanks for letting me join in. It's a great inspiration to keep your work caught up. The floor is a fantastic place to do art! Well you are one busy bee, hope the workshop and crop go well. Love the flower stamp on the little easel thing. Oh, I seem to have put the wrong link on mr linky widget - it goes to my editing of the blog post (what I get for trying to multi-task with little one running around!) which means that people can't actually get to the post. Is there anyway I can edit it or should I just resubmit a new link? I love the body under the ladder! So funny!! Your desk is nothing compared to mine this week.. I was almost too ashamed to post it! Notice I said Almost! You are very busy! Wish I could see the project on the upper right better. Have moved the gkids to their own place this week, baby due the 3rd. Now maybe I can get my things all together in one place again and craft again. Its been crazy. Would love a badge if possible. Will try to e-mail address. Goodness my e-mail will not talk to your e-mail. Frustrating when that happens, eh? Hi Julia, I like your birdie work. I've got some lovely birdie stamps i've not used yet. I must dig them out! hugs Jane. oh so many goodies going on!!! love it! It took me a minute to see the "victim," but then I was laughing out loud!! Just love this thing, being able to see what others are doing! Crops are alot of work but sooooo much fun! Your scissors are having a meeting? The cards are lovely and what are the white things in the package on the left? Thought I'd join in this week - I've been having a nosey at everyone elses mess for long enough now - so it's about time I returned the favour! is he holding the pitch fork too? that is just great!! Love it and all that craftiness, I didn't get home from mom's in time to get crafty this week but will be back playing next week. Ha ha, the picture of the ladder and its victim made me laugh out loud! Ooh, great busy busy desk this week! It certainly looks like you are getting a lot done! I will definitely email you because I would love a badge too! Thanks for a fabulous visit today! Love being able to participate with all these talented individuals. Thanks so much for hosting the WOYWW! FANTASTIC! Well, I'm actually hoping that the ladder is still there next week, because then I will have continuity in my life! Thank you again for another wonderful week of snooping around! All my best, and hugs. My goodness, what a list of comments! I've got to tell you, I enjoy reading all of them. I was bound and determined to get my post done before midnight and by golly, I made it with 37 minutes to spare. Today has been one of those move forward one step and back 10....but I made it. I'm heading to the list to see your desk and check out as many others as I can. Have a wonderful week...and by the way. I'm going to miss the ladder! Julia - thanks for hosting. More importantly I am so amazed at how this exploded, so may participants and you still seem to visit each time. Amazing!!! Oh my you are busy! Loved the guy under the ladder, too funny! A change is as good as rest so they say Julia, so I see the floor as being a welcome substitute for your desk. Loving the soft colours of the two cards too, really pretty. Like the cards on your desk, would love to see a bit more of them. I'll show you more of the little frames next week, "they might even get finished off" OR NOT LOL. Will put the felted bowl on its relly easy if i can do anybody can. Hello Julia, we sell the swirls at our crop and to anyone who wants some! Drat, just linked to the wrong week! sorry about that!!! Thanks for visit. I don`t make much doilies, I collect them for a long time, have one antique shop I buy there, I do some flowers every now and again. This GDT is a dream one so I`m very hapy to make 4 lo`s for them, one is ready so 3 more to go. My desk is positively bare to yours. Once my visitor leaves I have big plans. Statistically speaking...a photo less post.